As seen on the Speed Channel Two Wheel Tuesday! 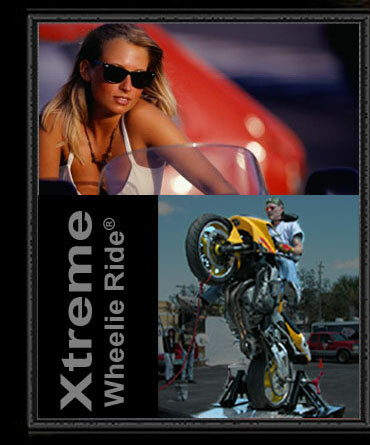 World wide exposure guaranteed, when you become an operator/owner for the Xtreme Wheelie Ride®. Full training support for your start up business. DYNOJET WHEELIE MACHINE - 1st one in the world! Don't Miss Out on this Once in a Lifetime Opportunity to Own a Piece of History! Also, be sure to check out the X13 Series Wheelie Machines - Very Affordable! XTREME WHEELIE RIDE is the FIRST & ORIGINAL in the ENTIRE WORLD - XWR is also the ONLY One Holding the PATENT on this Fabulous Machine! "I bought this wheelie machine 4 months ago from another company, their design was electromagnetic brake system; unfortunately this machine is broken down due to brake system & I'm totally out of commission. I wish I'd bought from XWR, the world-renowned machine. I regret this & desperately need help, please".